Continuing my article on ‘How to create a wordpress theme‘ , I will share about how to create wordpress theme with bootstrap framework step by step. To accelerate building wordpress theme, I use starter theme from underscores.me to accelerate building theme. With wordPress starter theme, The theme can work well with minimal of html and CSS script. Our job as developers is wrap this content with bootstrap framework that responsive. Why use a bootstrap framework? bootstrap is quite easy to use ,make our site more presentable, more responsive with a variety of smartphones and can be competitive in “Mobilegeddon” era. Press the generate button. Then copy the file that you have generated earlier into folder Wp-content > themes and extract your theme. * Include the Post-Format-specific template for the content. * called content-___.php (where ___ is the Post Format name) and that will be used instead. Please add a new menu on your wordpress (Appearance -> Menus) and see the results. 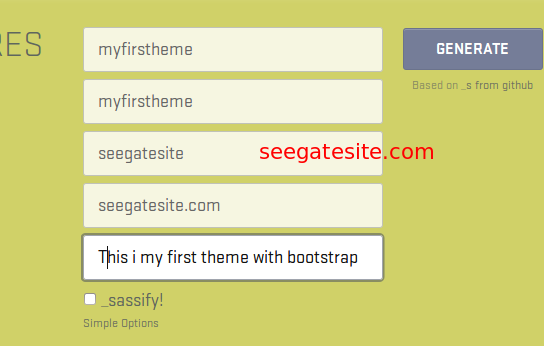 Conclusion : Making a bootstrap wordpress theme using starter theme is very easy to use . This site is a personal Blog of Sigit Prasetya Nugroho, a Desktop developer and freelance web developer working in PHP, MySQL, WordPress. Hi, this is a nice tutorial. I followed it and I have my custom starter theme but….the wp-admin styles are screwed up! How come? Never mind about the Font Awesome. I just read it again and we are to copy the whole folder. Still leaves an issue with the glyphicons (which I know is redundant because of Font Awesome). The tutorial was very informative. Thank you for that. after including this file menu changes to new layout and there was search box appearing but search icon is missing. its displaying glyphicon but you told us to use font awesome. are you load bootstrap css ? There are two ids in <input type="text" … in the new header.php. Hi, thank you for the tutorial! I’m having a problem with the navwalker menu. When I’m looking at the mobile version, the menu icon does not drop down when clicked. I compared my files to your downloadable them and I can’t find the problem. Do you know what could be causing this? I found my problem, the menu does not drop down if you are using the latest version of jquery. Hi, nice tutorial there. One question regarding the Bootstrap script. Shouldn’t jQuery be added as dependency when enqueuing the Bootstrap script in functions.php like below? Hello. I am having trouble with your menus. With the code exactly as it is above, the nav bar appears ok, but the only item on the left hand side of the nav bar is “Add a menu”. everything works ok. menu-1 is the slug for my custom menu inside WordPress. Hi, thanks for your response. I have created a menu, and that menu has been allocated to the “Primary” theme location, so I don’t know what the problem is. Hi, I know this tutorial is at least a year old, but I find it informative. I do have a question about the custom-js.js reference. The code you add into the functions.php file refers to a custom-js.js file, but the actual file name is customize.js. So I get an error message after I load a page: customizer.js?ver=1.0:12 Uncaught TypeError: wp.customize is not a function. How do you fix it? Do you want to get Free WordPress Videos, Plugins, and Other Useful Resources ? © 2019 - Programming Tutorial , Sharing , How and Learn Together Designed on rtPanel WordPress Theme Framework.